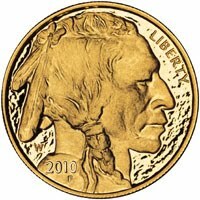 Earlier today, the United States Mint increased prices for the 2010 Proof Gold Buffalo and available First Spouse Gold Coins. At the same time, the price of the recently released 2010 Proof Platinum Eagle was decreased. The adjustments were made in accordance with the US Mint’s pricing policy for numismatic gold and platinum coins. Prices for numismatic products containing gold and platinum may be updated as frequently as weekly based on the average prices of the metals. Averages determined based on prices from the prior Thursday AM to the current Wednesday AM London Fix prices are compared to an itemized pricing grid with $50 price increments for gold products and $100 increments for platinum products. If the average price moves into a higher or lower range (and the Wednesday PM London Fix price agrees directionally), prices are adjusted proportionally. For the latest period, the average price of gold moved into a higher range, while the average price of platinum fell into a lower range. The price for the 2010 Proof Gold Buffalo was increased to $1,510 per coin from $1,460. The prices for the eight available First Spouse Gold Coins were adjusted to $779 from $754 for proof coins and to $766 from $741 for uncirculated coins. The price of the 2010 Proof Platinum Eagle was decreased to $1,792 from $1,892. These one ounce collectible platinum coins recently went on sale August 12, 2010. In the initial days of availability, the US Mint recorded sales of 8,268 coins out of the maximum mintage of 10,000. The lower pricing may hasten the widely anticipated sell out.